I am an English Language teacher in Brazil. The Wrong Trousers has 6 episodes. I have made some exercises to explore vocabulary. 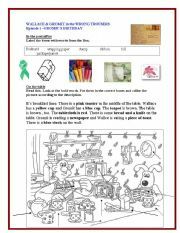 This worksheet is about episode 1: Gromit´s birthday. Today you can upload 2 of them. I will post the other ones tomorrow. 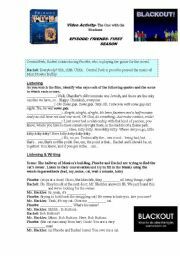 This is a video activity based on one of the episodes of FRIENDS ( The one with the blackout). Activities include listening/writing and grammar focusing on present continuous. 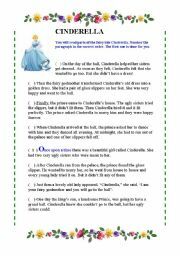 YOU WILL READ PARTS OF THE FAIRY TALE CINDERELLA. NUMBER THE PARAGRAPHS IN THE CORRECT ORDER.THE ANSWER KEY IS INCLUDED. The Wrong Trousers has 6 episodes. I have made some exercises to explore vocabulary. 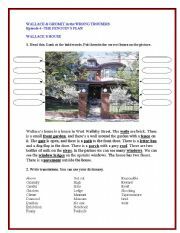 This worksheet is about episode 4. The Wrong Trousers has 6 episodes. I have made some exercises to explore vocabulary. This worksheet is about episode 6. The other episodes are all available. 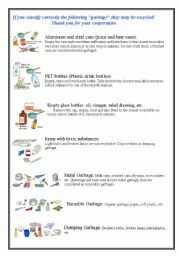 LET´S RECYCLE AND MAKE A DIFFERENCE. 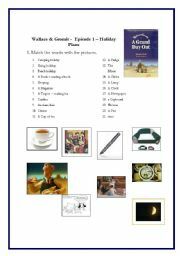 Wallace and Gromit are the main characters in a series of animations.Wallace is an absent minded inventor while Gromit is his faithful dog.The video A GRAND DAY OUT has 6 episodes and this is a video activity for the episode 1. The Wrong Trousers has 6 episodes. I have made some exercises to explore vocabulary. 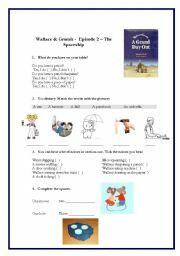 This worksheet is about episode 3:WALLACE, GROMIT AND THE PENGUIN. Today you can upload 2 of them. I will post the other ones tomorrow. 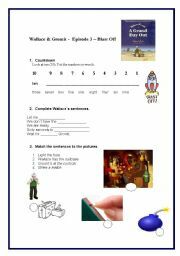 Wallace and Gromit are the main characters in a series of animations.Wallace is an absent minded inventor while Gromit is his faithful dog.The video A GRAND DAY OUT has 6 episodes and this is a video activity for the episode 3. 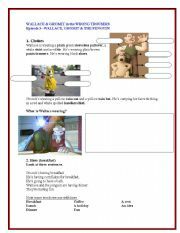 Wallace and Gromit are the main characters in a series of animations.Wallace is an absent minded inventor while Gromit is his faithful dog.The video A GRAND DAY OUT has 6 episodes and this is a video activity for the episode 2. HI THERE! THIS IS A VERY NICE AND SIMPLE PRESENTATION ABOUT THE STORY OF THANKSGIVING. LEARN ABOUT THE PILGRINS, THE FIRST HARVEST AND THE MAYFLOWER SHIP. THIS WAS DESIGNED FOR ELEMENTARY LEVELS. This powerpoint features artfully crafted designs with messages for a happy and respectful learning environment.I expect my students to follow the classroom rules. We need to work together to become successful!!! The complete pp has 10 beautiful slides. This is just part I. Enjoy!!! The most commom frequency adverbs and some exemplos as well as some questions for conversation at the of the presentation.I am thankful to Juan Miguel for the template. This is the 2nd part of the CLASSROOM RULES presentation.Enjoy!!!! PRESENT CONTINUOUS FOR ELEMENTARY LEVELS. Vocabulary related to school ACTIONS : OPEN YOUR BOOKS, READ, THINK, SIT DOWN, STAND UP, SPEAK ENGLISH,CLOSE YOUR BOOKS,WRITE, LISTEN TO THE TEACHER, DO YOUR HOMEWORK, DRAW, STUDY, ETC. There is a total of 15 slides including part I and II. I hope you like it. This is a presentation with the lyrics as well as a short biography of Louis Armstrong. All the pictures on the slides are breathtaking. Have fun!!! Vocabulary related to school OBJECTS: crayons, backpack, desk and chair, bulletin board, globe, overhead projector flashdrive, interactive whiteboard, notebook and flipchart. There is a total of 17 slides including part I and II.I would like to thank Epit Gul Gumuslu for the template.